Conversion rates up 15%. Time spent on product pages up 20%. Yes, Popyoular really works. We know you want real numbers to back up a potential investment in Popyoular for your business. Luckily, we have some fresh, highly relevant results straight from Platekompaniet, one of the leading music, film and game retailers in Norway with 26 retail stores and a highly successful online store at platekompaniet.no. 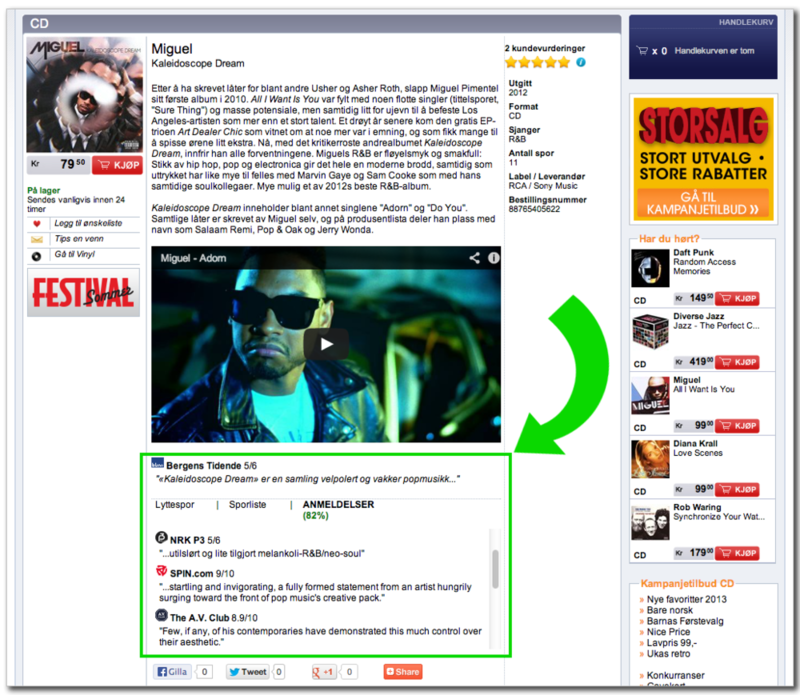 Platekompaniet have been running an A/B-test measuring the effects of the Popyoular context functionality, which is designed to give consumers relevant, editorial review-based recommendations integrated in product pages. Product pages featuring Popyoular data convert to sales on average 15% more often than the same pages without Popyoular. Customers stay on product pages featuring Popyoular on average 20% longer than on product pages without Popyoular. In both cases, the inclusion of Popyoular data led to better numbers than the original versions of the product pages on each individual day of the test period - there were no miselading peaks affecting the relevance of the average results. The implentation that was tested was Platekompaniets first stab at integrating Popyoular. Further tweaking and optimization could further improve the effects. Again, these results refer to the product-level context functionality only. They don't measure the additional effects of the Popyoular discovery functionality, designed to help consumers find more great content in the first place.